Sky, earth, sand, sailing, mining, wildflowers - are the images conjured up by the Western Australia papers. Somehow the clarity of the colours even seem to convey the vastness of the state. Guest designers producing just beautiful work with Western Australia include Tania Davey, Susan Johannes, Rachael Merrick, Michelle Tan and Kate Mills. Suz snapped this photo amongst others on a holiday to Margaret River, WA in 2004. (That silhouetted little tot is Phoebe...) Who knew four years later it would work so perfectly with Been There Done That Western Australia papers? 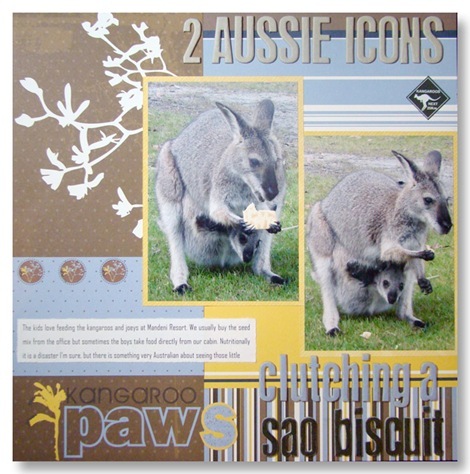 Suz has used them fairly simply adding journalling and her accents on a vertical strip. 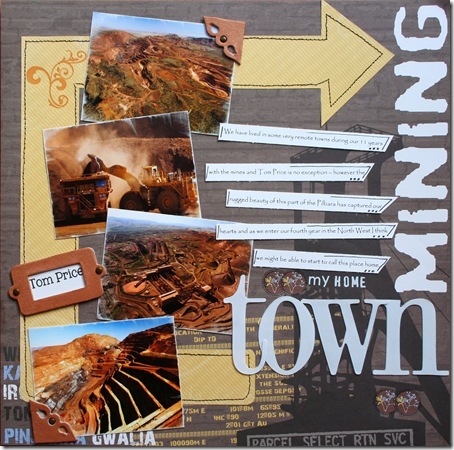 Its not often that specific paper for mining towns and mines comes along. The WA Mining boom paper was a perfect match for this page about the rugged area where Jaimie lives. 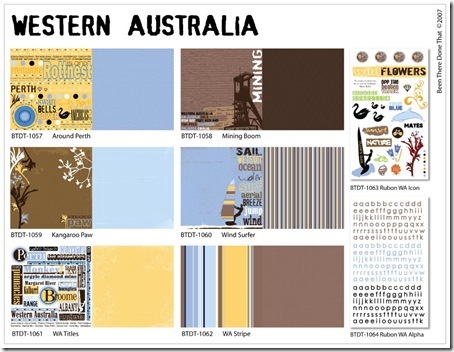 The rich browns, golds and blues of the paper mirror the Pilbara colours beautifully. Jaimie wanted to add that the photos have not been edited and that the dirt REALLY is that rich red colour. As soon as Cheryl pulled the WA papers out she knew she had to weave in a play on words with the Kangaroo Paw paper. Her kids are obsessed with animals and the place that they stay when they go on holiday to Merimbula has animals roaming freely around the cabins. 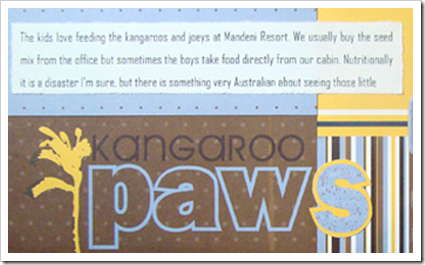 The boys were feeding SAO bikkies to the kangaroos and Cheryl snapped these pics (and many more). Kate Mills: When I first saw the papers I thought, oh my gosh I don’t live in Australia, what will I do? But it lends itself really well to all sorts of layouts. Michelle Tan: I love the versatility of the papers. The patterns on the reverse side of the state themes are beautiful. I love the delicate foliage pattern on the Kangaroo Paw paper and the rubons are great, three different colors and plenty of the essential alphabets. 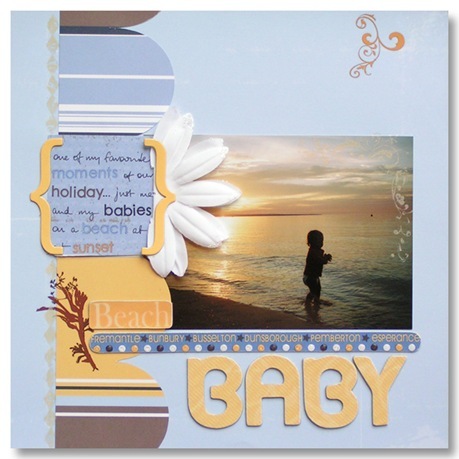 Rachael Merrick: Loved using this range, the colour combination of brown, blue and yellow threw me a little at first but I actually found it so easy to use. In fact I had a hard time choosing what photo to use for my layout. I also wanted to add how great the rubons were, so easy to use. We have loads of trouble with rubons in the tropics but these went on like a dream! For those who don’t know me, this is my 10 year old daughter Alesia, who is such a tiny sprite, quiet and yet lively in her own way. This year marks her last year in junior school and she has really begun to show those wonderful preteen signs of attitude and sass. 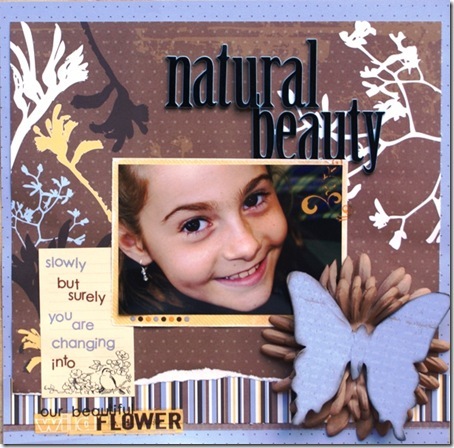 Susan Johannes: When I saw the wildflower in the paper I immediately knew I wanted to cut it out and use it with this stunning photo of my niece Irene. I must admit that I usually use much brighter papers but when teamed up with this Hambly transparency it really lifts the whole layout. I love the yellow and blue colours of these papers, which also matched beautifully with the Queen and Co. felt ribbon. The rub-ons for the title and butterflies went on like butter. It just goes to show that “travel” themed papers don’t always have to be used in that way. And how inspired are today's cards by Chris Millar! 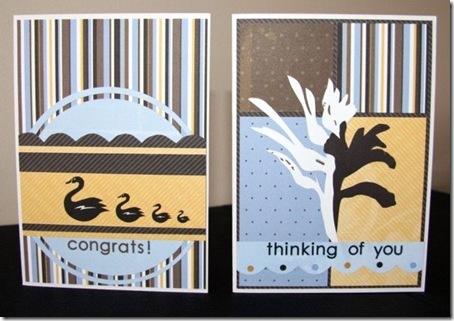 Chris thought the family of swans rub-ons would make a great card for a family of a newborn. 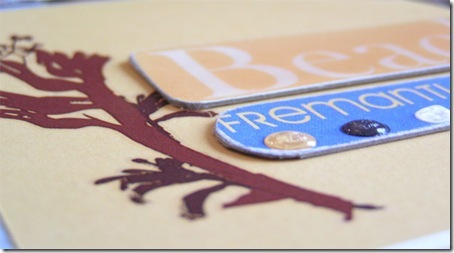 The colours in this range are also subdued enough for a 'thinking of you' card.